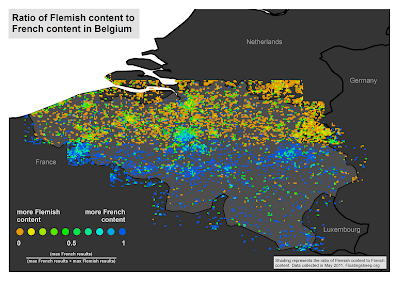 Continuing our series of posts from the participants in Iron Sheep 2012 (see maps by Team Lamb Chops here and Team Lamb Kebab here), we present the work of Team Rambouillet. Sadly, we don't actually have the flashy, blingy map to present, just a picture of Jim presenting it. Team Rambouillet focused (for lack of a better description of our laser like intensity) on crafting a fun and flashy presentation of the data. We were all intrigued by the UFO sighting maps (because aliens are cool) and our professional talents lent themselves to 3D presentations and animations. Working in pairs, two members focused on finding and processing data, while the other two worked on animation and presentation of the data. The result was an animated zoom onto a kernel density map with an embedded multimedia video. Sadly it really wasn't an answer on how to save the world (as we did not have time for much serious analysis) but it was flashy (dare I say Bling?) and silly which were the goals we had for the time limit. And we had a lot of fun doing it. We're still working on finalizing the dates for this summer's Sheep Camp. If you are interested in attending, please fill out this expression of interest so we can gauge possible attendance, best dates and target our small pot of travel funds. Building upon the discussion held at the IronSheep wrap-up session at this year's AAG, we are planning to hold a workshop (or SheepCamp) in Lexington, KY on June 1-3 or 15-17. The goal is to develop and work on a research agenda focused on critical analysis of big user-generated datasets. 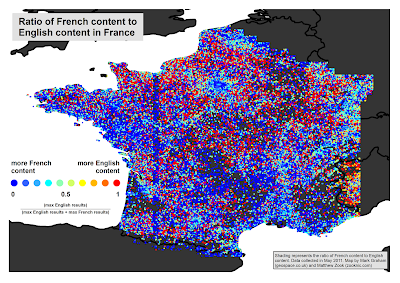 A measure of geo-coded material indexed by Google Maps for a range of keywords worldwide. At this time, we are not asking people to contribute their own sets of of data although that is certainly possible. To develop better understandings of the strengths and weaknesses of specific data sets their will be a series of pre-conference chats and brainstorming sessions with an eye towards drafting specific research questions so the camp can hit the ground running. Maybe even a keynote or two (or maybe we'll just visit a bourbon distillery). We are still exploring the options on this one BUT as this is a camp, this is very much "sleeping bag on floor" territory. We think it helps set this event apart from the normal conference thing and plus it really helps with cost. We will provide food and non-alcoholic drinks. Folks should plan on making their own travel arrangements and if you choose to fly we strongly encourage you to use Lexington's airport rather than Louisville or Cincinnati (which are both about 90 mins away). We do have a limited pot of money to help with travel and we'd like to maximize it. Please do let us know if you'd like help getting here, especially if you are a student. We hope that there might be some car pooling opportunities as well for those on the East Coast. After all, we ain't stupid. Team Lamb Kebab is the proud winner of the Worst Map (but in a good way) - "Sheep Happens" trophy at Iron Sheep 2012. They likely could have swept all the awards, except for the fact that they actually took the stopping time seriously (unlike certain teams we could mention) and as a result didn't fine tune their maps - especially the online and interactive one. It was the event's loss, but on the plus side, Team Lamb Kebab ended up with more pizza. Luckily we now have the opportunity to set things right by posting both the static and web versions of the maps. The Lunchpocalypse tool is meant to aid the enterprising zombie restaurateur in locating and exploiting key demographic clusters of organic-preferring zombie consumers. 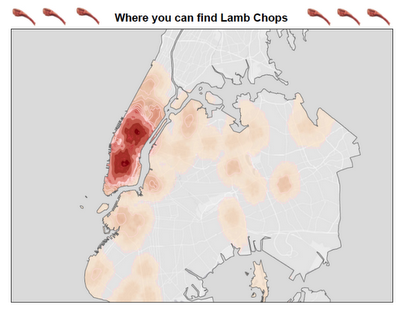 Simply plug in a NYC address, and you'll be able to see what the local preference is, leveraging a geodemographic segmentation analysis of the frequency of internet searches of the words "zombie" and "organic". Maximize your zombie profit and shuffle along with your organic herd to where the customers are! Because the dead are damn hungry!" 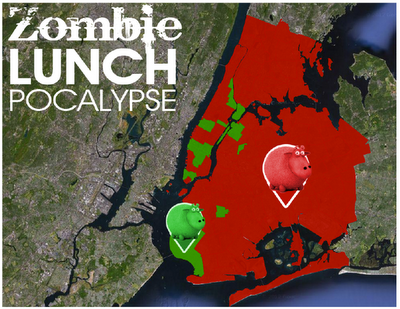 Click here for a truly amazing interactive map for the zombie on the hunt for lunch. 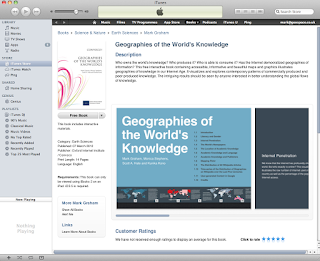 Our booklet, "Geographies of the World's Knowledge", is now available for iPads from Apple's iTunes store. The publication is free and is optimized for tablet viewing (we've included lots of cool interactive features). If you have a tablet, I highly recommend you check it out! If you don't, you can always download our PDF version in both English and German. Let me know if you have any questions/suggestions. If you are interested in attending, please fill out this expression of interest so we can gauge possible attendance, best dates and target our small pot of travel funds. We've posted the talks (or, more accurately, the Powerpoint slides) of the FloatingSheep collective presented at the 2012 NYC AAG below. Many of them are image rich and text poor, so please contact the presenter if you have any questions. 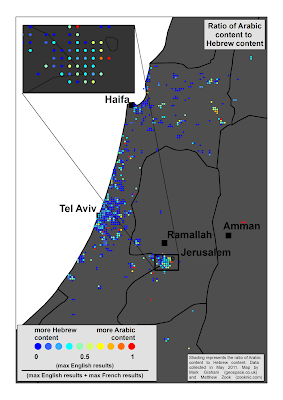 And, as always, you can download the full version of this paper from the journal's website if you have access, or get a prepublication version of this paper directly from us. Please get in touch with Mark if you'd like a pre-publication version of this paper. It will be appearing in Environment and Planning A. 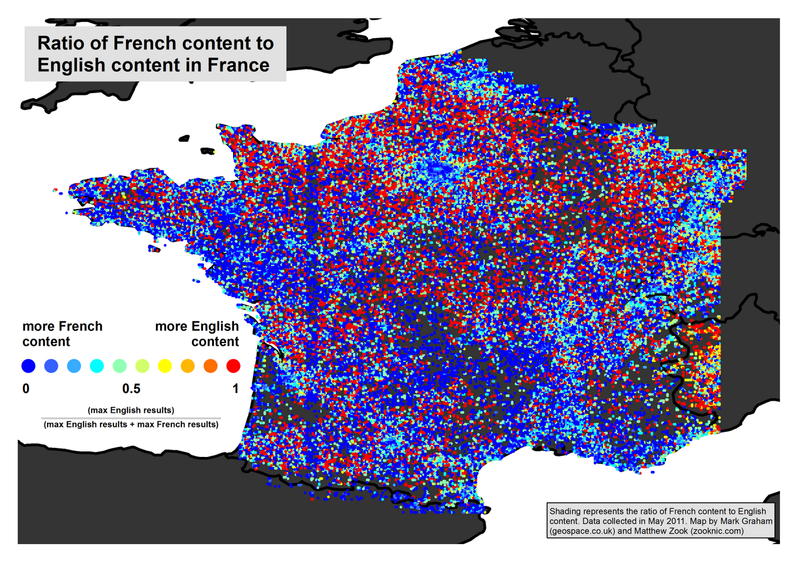 Volunteered Geographic Information: Does it have a future? I'm very happy to announce the newest member of the FloatingSheep collective: Ate Poorthuis. Ate makes a fantastic addition to the collective as we needed someome to blame my mistakes on, his research interests are focused on studying how user-generated data (Flickr photos, tweets) can help us better understand the processes and places of cities. He's has also been central in our ongoing collection of all geo-coded tweets and, finally, he's not afraid to map zombies. Ate is currently a PhD student at the University of Kentucky’s Department of Geography. A recent transplant from the Netherlands, he has a Bachelor’s and Master’s degree from the University of Amsterdam (also in Geography). 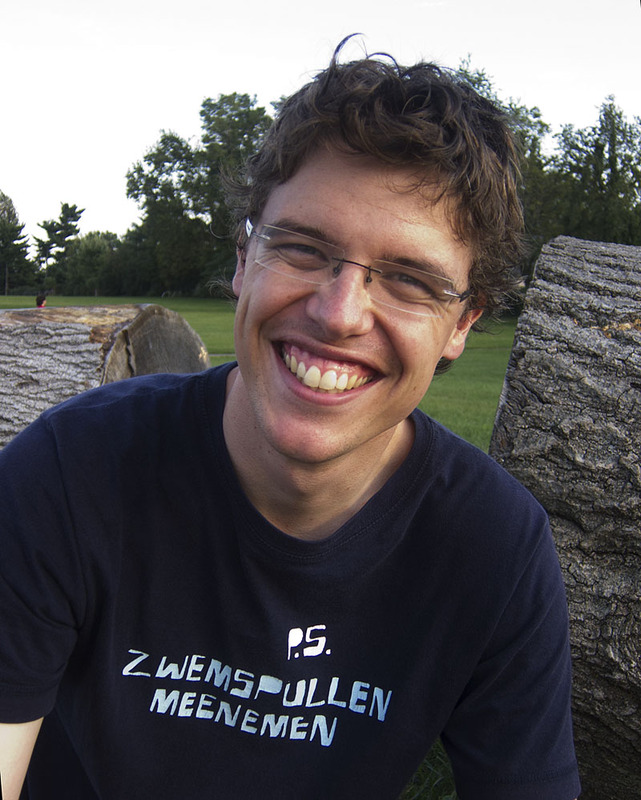 His interests are at the crossroads of urban geography, public space and the Geoweb – subjects that he also likes to explore via a mix of coding, mapping and data viz. He gave a really interesting presentation at the 2012 AAG on the production and consumption of tourist places, using Flickr photos and comments of NYC's High Line Park as an example. Particularly innovative is his application of space-time permutation scan statistics (which comes out of epidemiology) and can be very useful in identifying clusters in both space and time. Prior to beginning his Ph.D. at Kentucky last fall, Ate wrote a great Master's thesis using the location of Flickr photos to study the density of urban digital landscapes and the differences between what "locals" and "tourists" document. Gender, geography, race, income, and a range of other social and economic factors all play a role in how information is produced and reproduced. People from different places and different backgrounds tend to produce different sorts of information. And so we risk ignoring a lot of important nuance if relying on big data as a social/economic/political mirror. We can of course account for such bias by segmenting our data. Take the case of using Twitter to gain insights into last summer's London riots. About a third of all UK Internet users have a twitter profile; a subset of that group are the active tweeters who produce the bulk of content; and then a tiny subset of that group (about 1%) geocode their tweets (essential information if you want to know about where your information is coming from). Despite the fact that we have a database of tens of millions of data points, we are necessarily working with subsets of subsets of subsets. Big data no longer seems so big. Such data thus serves to amplify the information produced by a small minority (a point repeatedly made by UCL's Muki Haklay), and skew, or even render invisible, ideas, trends, people, and patterns that aren't mirrored or represented in the datasets that we work with. Big data is undoubtedly useful for addressing and overcoming many important issues face by society. 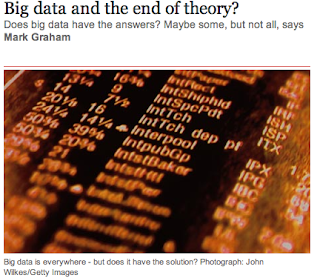 But we need to ensure that we aren't seduced by the promises of big data to render theory unnecessary. We may one day get to the point where sufficient quantities of big data can be harvested to answer all of the social questions that most concern us. I doubt it though. There will always be digital divides; always be uneven data shadows; and always be biases in how information and technology are used and produced. And so we shouldn't forget the important role of specialists to contextualise and offer insights into what our data do, and maybe more importantly, don't tell us. Anyone who attended the AAG in New York this year was likely inundated by Floating Sheep stickers. We had thousands of them and were NOT shy in passing them out. Indeed, many an attendee might now be wondering where exactly the sticker discovered in their bag came from. Perhaps they are even reading this post. Therefore we issue the challenge to new and old readers to send in photos of sightings -- including ones you put up yourself -- of the floatingsheep sticker . Need stickers? Send me your address and I'll mail some out (zook [at] uky [dot] edu). Need motivation? I think we still have an floatingsheep ornament kicking around, which we'll award to some one. Be sure to come to the next AAG, there are rumors that temporary tattoos will be making an appearance. Anyone showing up with a permanent floating sheep tattoo will likely never have to buy their own drinks. For example, we found (by which I mean we placed) a sticker on a very extensive (i.e., crazy) rant on 57th street in Manhattan. A day later, the sticker had been removed, apparently the side commentary was not appreciated. Apologies for the lack of posts over the past week, but we were first in the thick of IronSheep-itude and then busy trying to catch up on everything (teaching, sleeping, family, personal hygiene, etc.) that we put on hold for the event. But to sum things up, it was a great success! Not only was it a lot of fun but it helped push forward thinking about how to approach user-generated data and online mapping technologies more generally. Over the next weeks we'll be posting a lot of material/maps from the event, the debriefing session at the AAG and thoughts about next steps. But first some heartfelt thanks to those who made this event possible. First a very big thank you to Pivotal Labs (especially Magda Kozak) for be so unbelievably generous and helpful in providing the space for IronSheep. It was perhaps the closest thing to map-geek heaven we're going to find in this world. Also many thanks to Sean Gorman of GeoIQ who provided key encouragement and connections (although sadly couldn't attend in the end) and Javier de la Torre of Vizzuality who made the key introductions to secure the space. Thanks to all those who attended the debriefing session at the AAG, there was a lot of good food for thought/debate coming out of that. Towards that end, see the upcoming #geowebchat scheduled for Tuesday, March 6th, with a slightly longer overview of the debate outlined by Jeremy Crampton here. Thanks to all the floating sheeple – Mark Graham, Taylor Shelton, Monica Stephens, Candice Wallace and Ate Pourthuis – who scrounged data and organization to pull off the event. Finally many thanks to all the attendees who were willing to take a chance on something as strange-sounding as IronSheep. They are featured below (in team pictures) and we look forward to hearing from them as they describe their maps. 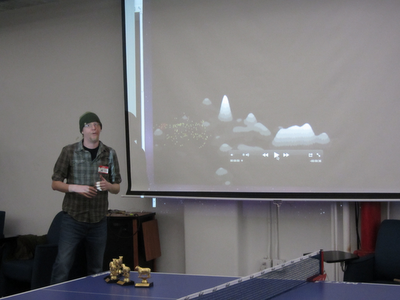 To start out the IronSheep review, we've posted a number of photos of the event, activities and participants below.